This post is written in partnership with Defay Orthodontics, but all opinions shared are 100% honest and are my own. Thank you for allowing us to share with you products that we use and love with you to keep our website going! From 1997-1999, I had braces on my teeth. My teeth were horribly crooked and I had a very narrow mouth, so I also had to wear a device at the top of my mouth that I called “The Crank” – every night before I went to bed, I had to “crank” it to widen my mouth . . . I DO NOT miss that contraption! My tongue was also pushing my front two teeth out, so I had to wear spikes on the back of my front teeth to train my tongue to stay in place. I am SO glad those years are over! When the braces came off, I LOVED my straight teeth. It’s amazing how confident straight teeth can make you feel!! It made such a big difference for me all through high school. Fast forward 20 years . . . I stopped wearing my glow-in-the-dark lady bug retainers as soon as I went to college. I figured that my teeth really wouldn’t move that much . . . right?? And then 4 babies came along. WHO KNEW that hormones could also make your teeth move?? Combined with not wearing my retainers . . . it wasn’t good. My bottom teeth were all moving forward and pushing my front teeth back, my top teeth were twisting in ways that teeth should not twist. My overbite was back and I was grinding down on my bottom teeth because of all the movement, which were causing some big problems (such as headaches and jaw popping)! WHAT WAS HAPPENING? Even my dentist suggested getting to it looked at because if I could fix it now, it would save me some big dental bills down the road. When you look at my teeth, you might think they are *pretty* straight, but they have moved SO MUCH since I had my braces taken off 20 years ago and it’s something that I have always wanted to get taken care of (we lovingly refer to my bottom tooth as my snaggle tooth- ha ha!). My husband and I found a way to work the cost into our monthly budget (they have many payment plans available, or you get a discount for paying in full at the beginning of your treatment). 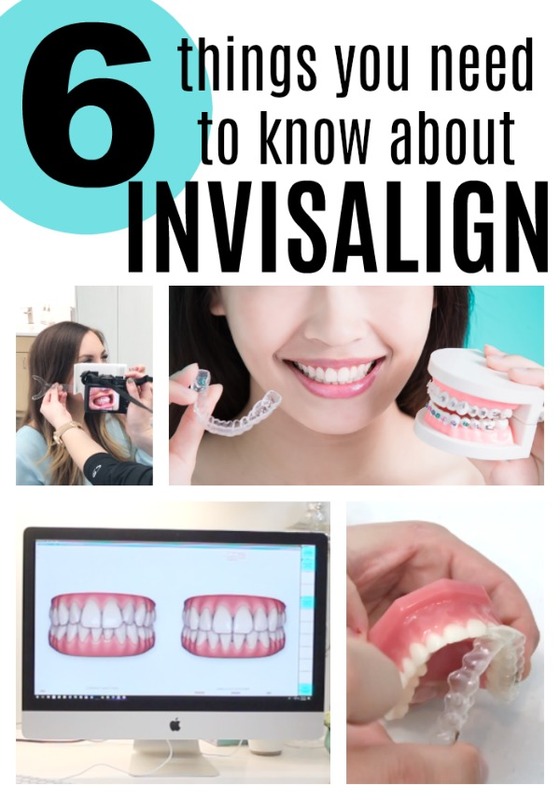 I had heard about Invisalign as a great option for adults, but I didn’t know much about it, so I started researching. I discovered Dr. David Defay is an Elite Invisalign provider, which means he is one of the top certified Invisalign providers out there because he has treated over 300 Invisalign cases and continues to treat at least 100 new cases each year (and bonus – he is right down the street from me with offices in Kaysville and Farmington, UT). 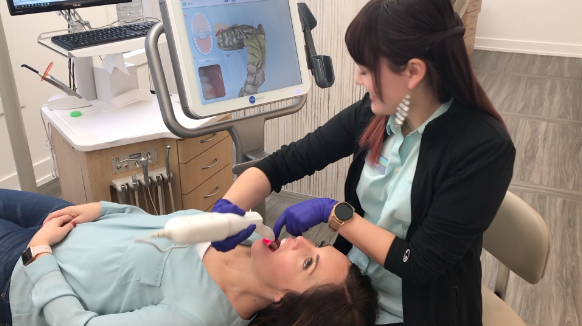 I set up my first consultation, which is always free, and here is how it went down – I wanted to share with you what a free Invisalign consultation is like so that you know what to expect and so you can decide if this is something that you want to do! 1. It’s all done digitally! I was fully expecting to have to do all the “goopy impressions” and mouth molds like I did the first time I got braces . . . not anymore! The scan was done using the coolest 3D camera (an Itero Scanner – this thing is crazy! It actually scans the contours of your teeth and gum and gives such accurate results!) and and they had all my scans within minutes! 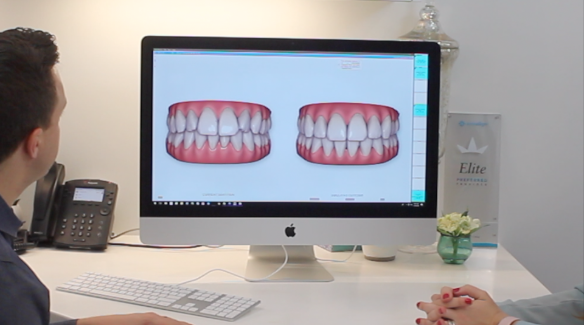 The orthodontist will then send in those scans to have your aligners (the clear trays that you wear) created. 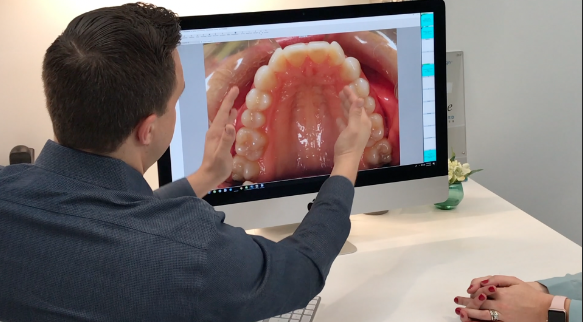 Because each tray is custom-made from those scans for you and it’s so precise, you can see what your teeth will look like at the end of treatment at this first consultation. It was amazing! 2. Most of the time you have “anchors” placed on your teeth to hold the aligners in place. Just like braces, most people will have a few anchors or buttons cemented onto specific teeth (depending on their treatment plan) to hold their aligners in place. Thankfully they are not painful like braces (my brackets would rip up the inside of the mouth when I had braces!) and are actually the same color as your teeth, so they are very discreet! I see this as both a pro and a con. Ha ha! In order for treatment to be effective, you need to wear the aligners for about 22 hours a day. You should only remove them to eat, drink, or brush your teeth. You can’t eat with the aligners in because it could alter the aligners and mess up your treatment. It will also discolor your aligners, making them more noticeable (or making you look like you have yellow teeth). Food can also get trapped between your teeth and the aligners, which can lead to decay. I do love that because they are removable, you can still eat everything you want (I remember not being able to eat apples, caramels, or corn on the cob for a long two years while I had braces!). Because Invisalign is removable, you have to be responsible about properly cleaning and wearing them . . . which is why they don’t always recommend it for teenagers. 4. Invisalign is very similar in cost to traditional braces. 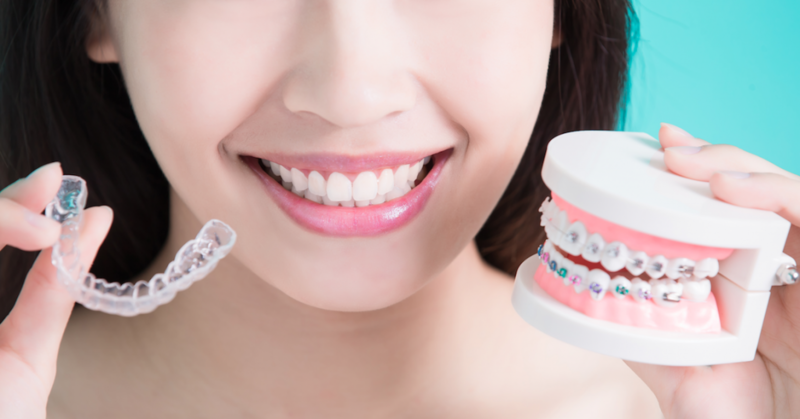 I had always thought that Invisalign was a lot more expensive than braces, but with all the advancements in the technology, it has become very cost-effective. Each case will be a little different, but for me, the cost of Invisalign vs. braces was about the same price! Defay Orthodontics also has payment plans, which make it so that you can make a monthly payment instead of the entire amount up front. 5. Invisalign is actually really comfortable. I remember those first few days after getting my braces tightened, I was in so much pain! 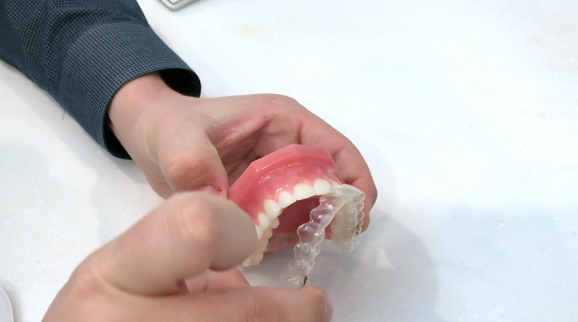 The first couple of days with Invisalign might be uncomfortable (your teeth are definitely moving! ), but they are a more comfortable alternative to traditional braces and won’t completely rip the inside of your mouth up (I had callouses in my mouth for 2 years while I had braces). The plastic used to make the aligners is so light and smooth. If there ever is a spot that feels uncomfortable, your orthodontist can smooth it out, which I love. 6. Invisalign is becoming the most popular treatment for adults. 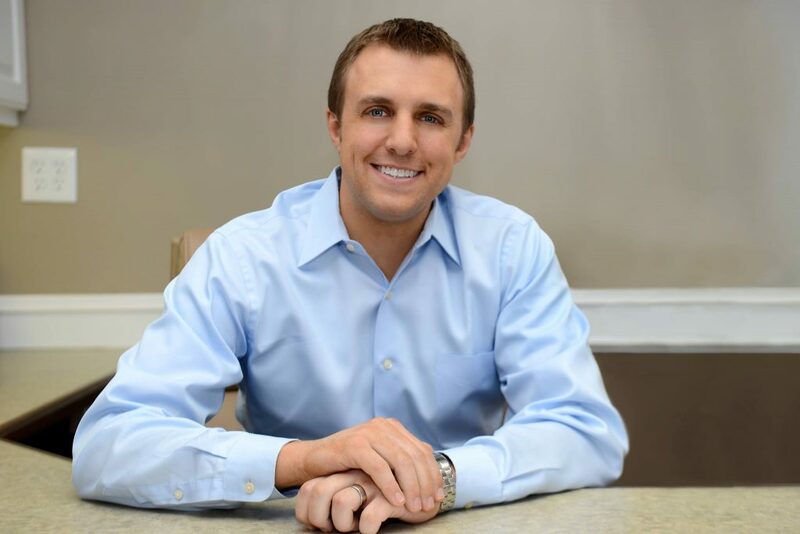 At Dr. Defay’s office, he treats 90% of his adult patients with Invisalign! Every case is different, but for most adults he recommends Invisalign because of the amazing results they provide. So, there you have it! 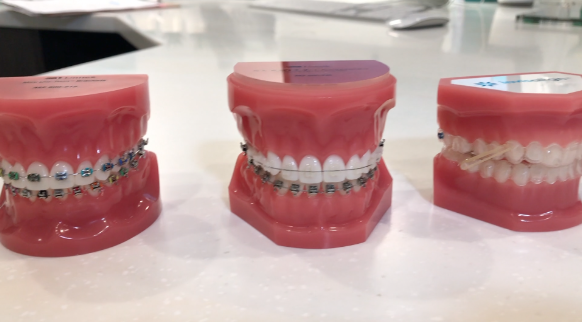 My consultation went super well – I was blown away by Defay Orthodontics and that their office was all about the state-of-the-art technology. I was so worried to be the only adult going through treatment in an office full of teenagers, but come to find out there are MANY adults that he treats! The separate adult waiting room with the massage chair, HGTV, and beverages was also a bonus. 🙂 I might go there to just escape my children for a quick minute, even if I don’t have an appointment! I decided to move forward with Invisalign and will be sharing my journey on here and YouTube! Stay tuned!